This goat is part of a series of animals that all use the same basic body pattern. 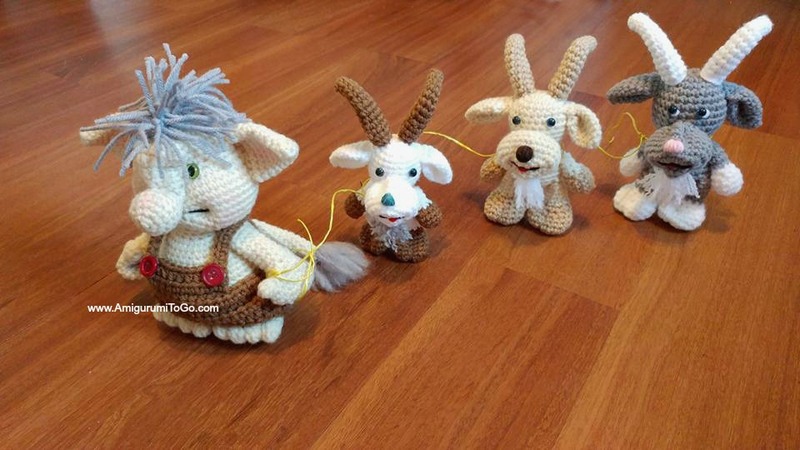 You will need to make the basic body, link in the supplies list, then come back here for all the parts that make it a goat. Optional: pipe cleaners for the horns. This is optional but the pipe cleaners do really help shape the horns. For those afraid of using them, I show you how to stitch them in so they don't move or ever poke through. 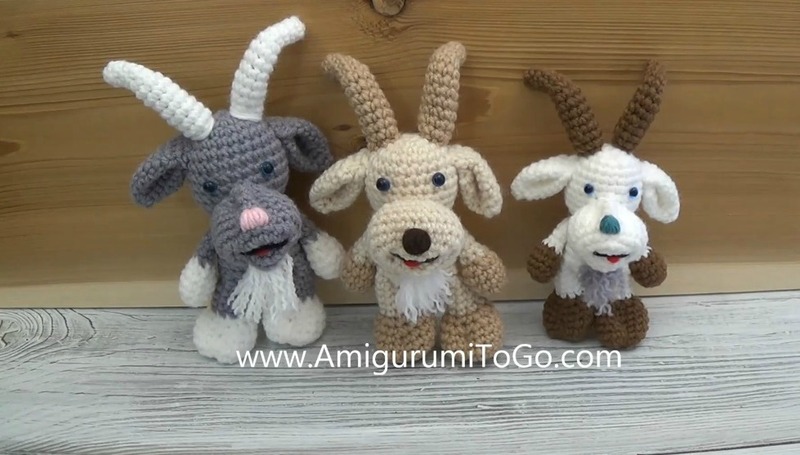 Eyes: The goats you see pictured have 7mm-8mm safety eyes in between the 6th and 7th row with 4 visible stitch holes between them. At the end of the video series I do show how to wrap yarn for the eyes if you do not have safety eyes. sl st next st and f/o leaving a long tail for sewing. Stretch the muzzle out, stretch it out side to side. The finishing yarn tail should be center at the bottom. Whip stitch a nose over the 5th and 6th row Knot yarn tails inside muzzle when done. Set muzzle aside and make the other parts. At 6 minutes into this video I show how to stitch in pipe cleaners so they will never poke through. They will make the horns poseable but you do not have to use them. The top of the muzzle is sewn on or about row 9 and the bottom on or about row 12. Pin muzzle in place before sewing. Take your time and be sure it stays centered as you sew. Leave a little gap for stuffing more in if needed. Use a stuffing stick and push the stuffing to the sides of the muzzle so it maintains its shape. Then close up the gap, knot off and hide yarn tail inside the head. I want to say thank you for all of your pattern that you post I love them all thank you so much. I made this... One word...AMAZING!!!! can't wait to make this for a very good friend who I met in grade one, 50 years ago!!! she owns her own GOATS milk soap company. she's going to love it thank you so so much for all your wonderful patterns. I love them all! !